Combining high efficiency in both hot water and central heating modes, the Combi Compact HRE’s energy-efficient design is a perfect example of our revolutionary condensing boiler technology in action. The HRE is available in four power outputs to satisfy most domestic applications. All our HRE boilers are Energy Saving Trust recommended. 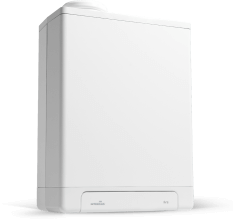 Every Intergas Combi Compact HRE boiler features our unique back-to-back, two-in-one heat exchanger that reduces heat loss and delivers the optimal heat transfer for an exceptionally economic performance year after year. Separating the circuits for heating and hot water also means there’s no need for a diverter valve or secondary domestic hot water plate heat exchanger, eliminating the source of possible future component failures. Every Intergas heat exchanger is guaranteed for 10 years. Our Combi Compact HRE A is fitted as standard with a continuously adjustable control system that automatically adjusts the boiler’s power output to the desired heating level. What’s more, it is fitted with a self-learning eco-comfort switch, which automatically turns the hot water supply heat retention feature ON and OFF. This is particularly useful if you don’t need hot water for a while, e.g. at night or when away for an extended period. Our Combi Compact HRE A is compatible with both ON/OFF and modulating thermostats using the OpenTherm protocol.